Well-regarded dentist from Mount Pleasant, SC, Dr. Kevin Hogan, has completed sessions two and three of a prestigious Misch Institute continuing education course as part of his commitment to staying abreast of advances in dental implants and related technologies. As a result of Dr. Hogan’s participation in the Misch Institute course, he plans to bring a deeper understanding of dental implant prostheses to his team and patients. Dr. Kevin Hogan, a highly regarded dentist from Mount Pleasant, SC, has announced his completion of an intensive Misch Institute continuing education (CE) course. Dr. Hogan attended sessions two and three of the Prosthetic Series held in Irvine, CA. As a top provider of dental implants, he is committed to learning as much as possible about leading-edge techniques, protocols, equipment and methodologies related to implantology. Sessions two and three of the Misch Institute series focused on a range of issues forward-thinking dentists need to understand to best serve their patients. Some highlights from the CE course include understanding the differences between prosthetic teeth and natural teeth, creating fixed treatment planning schedules to improve efficiencies and outcomes, discussing monolithic zirconia prostheses, evaluating the pros and cons of screw versus cement prosthetics, and numerous complementary concerns and subjects. As a result of Dr. Hogan’s participation in the Misch Institute course, he plans to bring a deeper understanding of dental implant prostheses to his team and patients, thereby improving single and full arch implant solutions at the practice level. Always interested in cosmetic dentistry with a functional aspect, Dr. Hogan has been a lifetime learner. His dedication to staying ahead in advancements in dentistry has earned him a stellar reputation in his community, as well as among peers. 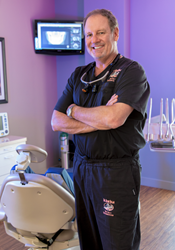 Those interested in being evaluated for dental implants and implant prostheses, or who wish to change to a new dentist in Mount Pleasant, SC, are encouraged to contact Dr. Hogan’s comfortable, modern office at 843-216-0908 or visit http://www.smilesbyhogan.com to book an appointment.